The town of Severna Park has more than one hundred properties that are on the National Registry of Historic Places – all this for a town that has less than 40,000 inhabitants total. What this means for home owners is that the majority of the houses in the “core” of Severna Park are relatively old, using building methods that are not necessarily as maintenance-free and durable as the ones that are used today. If you own a historic home, or if you have a regular modern home and just want an upgrade, you should be familiar with the various types of exterior paint that are available to you. Your choice of paint type makes as much a difference in your home’s appearance and health as any other major design/maintenance decision – and it can impact your home for decades down the road. When you’re ready to refresh your home’s exterior painting job, call your local Severna Park MD exterior painting company for professional advice and immediate results. 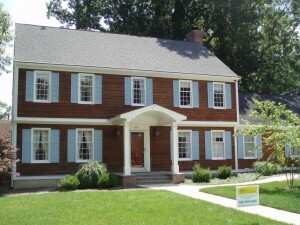 All Painting and Power Washing is your best bet for Exterior Painters in Severna Park! What Is The Difference Between Exterior Paints? There is a lot more to exterior paints than just color – and your choice of exterior paint is going to make a profound difference in the ultimate outcome of your painting project. Interior paints come in only a few different varieties – but interior paints are protected from the weather and they aren’t expected to get as much traffic (or last as long) as their exterior paint peers. On the other hand, the exterior paint that you use will be subjected to everything from the rays of the sun to hurricane-force winds and rains, so you want to pick a high quality exterior paint that you can use as the base of your home’s protective layer. There are plenty of places that you can cut costs in your home renovation and design, but your exterior paint quality shouldn’t be one of them. If you go to a paint store or home improvement store, the sheer variety of exterior paints might be overwhelming at first. Think about the huge variety of exterior types in the homes of Severna Park alone. People have everything from the original wooden siding of the pre-Civil War homes to the painted brick that has been fashionable all the way since the 1700s. Since there are so many types of exteriors, and so many different applications of these paints, you have to be careful to choose a paint that is designed for a house like yours. This is where professional painting companies come in – we have the experience to know what kind of paint will work best for a house like yours, and we’ll make sure that you end up with a paint that respects both your budget and the aesthetic goals of your repainting project. The first type of exterior paints that have become very popular in the United States are so-called Latex paints. These paints are water soluble – but that’s a term that refers to the delivery vehicle of the pigment rather than any waterproofing properties that the paint has. In reality, while Latex paints are very viscous and easy to apply, they are still relatively waterproof. Latex paints are cheaper than the oil-based paints, and they can be thinned with water so they are extremely easy to use for amateurs and professionals alike. Many professional painting companies like ours have technologically sophisticated paint application hoses and spray guns that are designed to aerosolize latex paints to get a more even coverage of your home’s exterior. On the other end of the exterior painting spectrum you have oil-based paints. Oil-based pants are more expensive than the Latex paints that most home owners use, and they are harder to work with – requiring mineral spirits and paint thinner to remove or thin the paints during use. The paints are superior for glossy coats of paint and for bright colors that you require long-term fade resistance – but there is a growing movement in Maryland to restrict the use of oil-based paints because they are harder to dispose of and there is some concern that they might have a negative environmental effect. With all things considered, we usually recommend oil-based paints if your house is in full-sun for the majority of the time (since the glossy coat reflects more of the sun’s damaging UV rays) or if you require a paint job in a color that needs to be extremely bright in order to “work” with your home – like a red or an orange. Of course, the quality of your paint is only half of the equation. If you don’t have a good primer – the paint that you apply to your home will just flake off and peel, leaving your home looking like it has aged a hundred years in a matter of hours. Primers are used to even out surfaces for painting – creating a smooth surface that paint can actually stick to. On surfaces like wood and brick, primers fill the tiny pores and gaps in the surface itself – allowing paint to create an unbroken and smooth surface that will be pleasing to the eye along with totally water repellant. On many wood surfaces, primers actually prevent compounds in the wood itself from leaching into the paint! If you use an oil-based paint on a nice hardwood like cedar or redwood, the tannins in the wood leach into the paint after dissolving in the oil – and they can discolor the paint or cause serious streaking. This is why it is so important to prime a deck before you paint it – or a wood home like some of the older historic buildings in Severna Park MD. Finally, a good primer can even have “stain blocking” properties which hide stains and make damage of the surface underneath less apparent. If you are painting a historic home, you are usually dealing with a somewhat imperfect surface that has a great deal of “character” from age – so a primer that can be universally applied no matter the surface imperfections is ideal. You can call us at 443-790-7145 or fill out the form below for a FREE Estimate on your Severna Park painting project. A member of our local Severna Park All Painting and Power Washing team will be in touch shortly.